South Georgia Tormenta FC has signed midfielder Dalton Pando to its 2019 USL League One team, pending league and federation approval. The California native last played for FC Tucson in 2018 before signing with Tormenta FC. “He is hungry and determined to make the most of his opportunity with us,” Miglarese said. “I am excited to see what he can do this season." Pando began his college career at Johnson and Wales University in Denver, Colorado, before transferring to the University of California at Santa Barbara. His freshman year, he led his university team, appearing in 19 games with 16 goals and 16 assists throughout the season. In 2015, he was named conference Newcomer of the Year and appeared on the All-West First Team. Growing up, Pando was a part of Real Salt Lake Academy and San José Earthquakes Academy. The midfielder also participated in the U.S. U-17 National Team Residency Program in 2012. Before joining FC Tucson’s League Two team in 2018, he played with Nashville SC for one season. 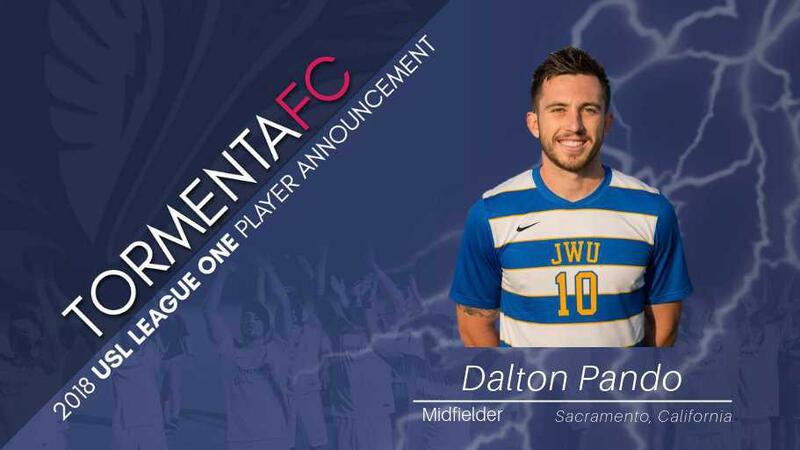 Pando is the 15th player to sign with Tormenta FC’s 2019 USL League One team. Other signees include Conner Antley, Jad Arslan, Micah Bledsoe, Lucas Coutinho, Charlie Dennis, Lars Eckenrode, Ricardo Gómez, Pablo Jara, Michael Mecham, Michael O’Sullivan, Joshua Phelps, Jerry Saint-Vil, Nick Wells and Nil Vinyals.